Metrorail, operated by the Washington Metropolitan Area Transit Authority, serves the Capital and surrounding areas in Maryland and Virginia. The system consists of five lines and over 106 unduplicated route miles. Much of the Metro, as it is commonly called, is in subway, including sections dug deep under the District's surface. Many underground stations have characteristic vaulted ceilings and a notable minimalist approach to location signs and artistic frills. Also often present are impressively lengthy escalators to carry passengers between platform level and the street. There are many long above-ground or surface-level stretches further out, sometimes paralleling railroad lines, on the routes radiating from the core area. And the Orange Line emerges from its subway past Ballston-MU in Arlington to complete the rest of its run in the median of a busy expressway. 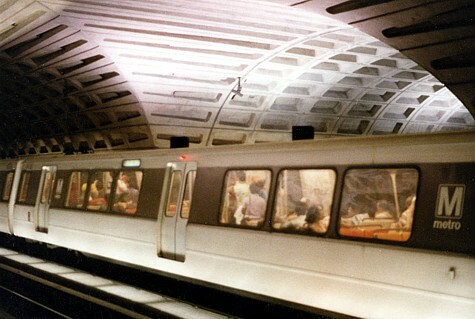 The first Metro segment opened in 1976; the system reached completion of its original plan (around 103 miles) just about one quarter of a century later. Of all the latter-day urban transit projects developed in this country, this network is likely the most indispensable to the area it serves.